AC Martin is one step closer to completing L.A.’s newest and tallest tower. 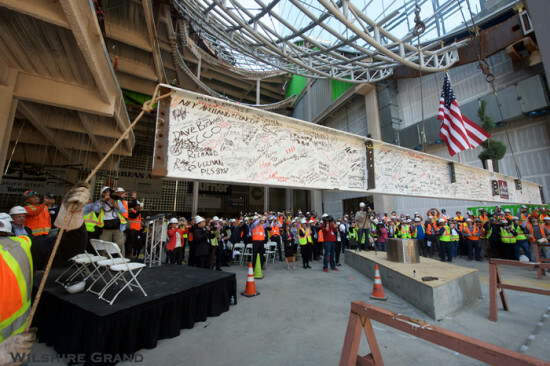 As workers and business executives in hardhats scribbled optimistic phrases like “we did it!” and “one year left to go” onto a massive wide flange beam, Wilshire Grand Tower, LA’s soon-to-be tallest spire, topped out Tuesday afternoon at a gregarious ceremony hosted by Turner Construction and AC Martin, the tower’s chief contractor and architect, respectively, and Korean Air, developer of the project. 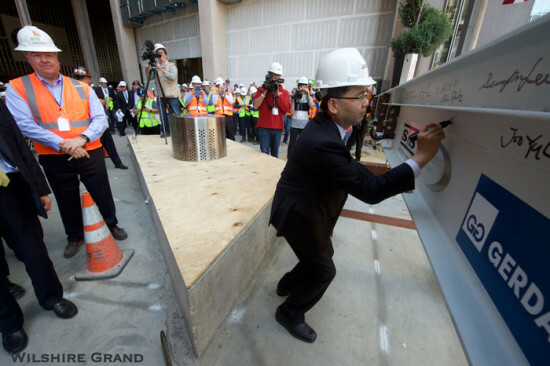 Workers Foisting the core’s final structural beam into place at Wilshire Grand Tower. Photograph courtesy of Gary Leonard/Wilshire Grand Center. Crew members cheered as cranes lifted the final beam into place, 892 feet up, completing the structure’s core and leaving only the tower’s top floors and spire to be constructed. 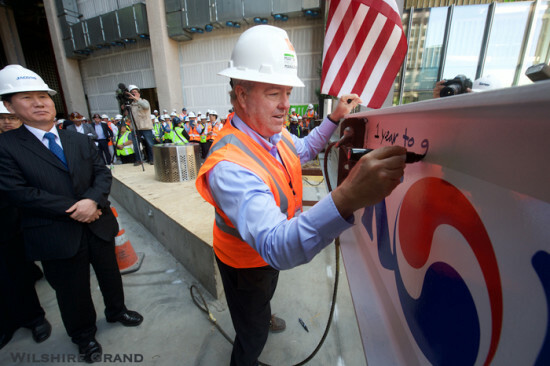 The ceremony, attended by many of the 800 workers rapidly assembling the west coast’s newest homage to high strength concrete and glass, included a barbecue lunch prepared on site that filled the surrounding business district with the wafting scent of mesquite. The event was celebratory in nature, with team members, executives, and elected officials posing for photos as journalists surveyed the cavernous rib cage of the building’s future shopping plaza along Figueroa Street. 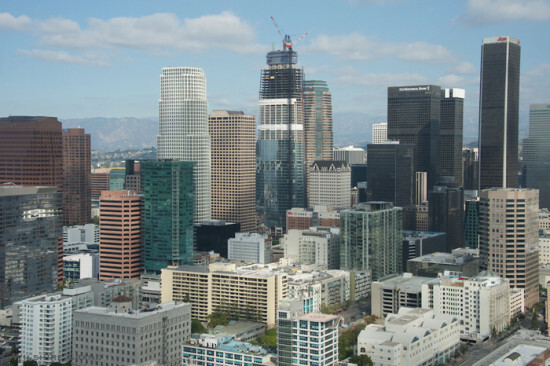 According to Turner Construction’s website, when completed, Wilshire Grand will host 20 floors of Class A office (400,000 square feet) and a 42 story hotel consisting of 900 suites. The aforementioned 400,000 square feet of podium along Figueroa is set to include ballrooms, meeting halls, pedestrian-oriented retail, and a 1,250-spot parking garage. 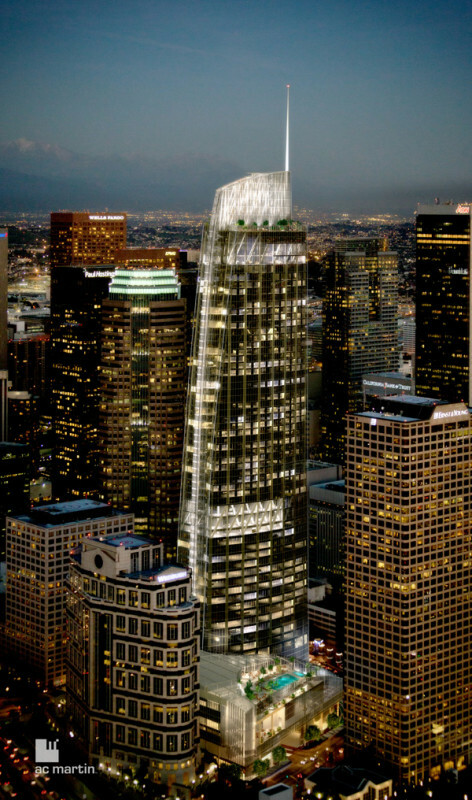 Rendering of Wilshire Grand Tower. Rendering courtesy of Turner Construction and AC Martin. The structure is the first building to rise since L.A.’s City Council overturned a 40 year fire safety rule mandating flat-topped skyscrapers in the city. Wilshire Grand Tower, rising to 1,099 feet in height, will also the first to employ a concrete core instead of a prototypical steel frame. This novel (for Los Angeles) roof shape will contain a sky lobby, observatory, sky pool deck, and restaurants. The building, set to rank as the second tallest building west of the Mississippi River upon completion (taller than San Francisco’s Salesforce Tower, but shorter than Seattle’s 4/C Tower), is due to finish construction in early 2017.